Basic shipping is $25 and includes the cost of shipping materials, boxes & insurance. Keep in mind; although Lavender is light, we are charged "dimensional weight" & for the longer Lavender it is usually a couple of dollars more for extra length of the box. Looking forward to our 2019 Harvest in July! Half the block will be mature "Violet Intrigue" & "Hidcote Purple" Sweet angustifolia Lavenders ... With the new planting last year, we have added lots more classic "Hidcote purple" with some slender French "Maillette Blue". Plus some "Fred Boutin" blue Lavandin for their extra long stems. 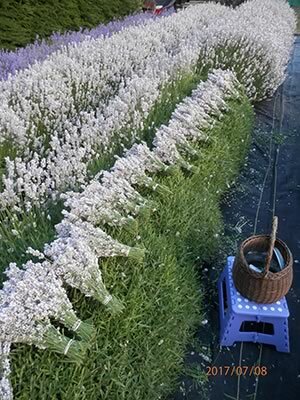 Sweet angustifolia Lavenders are the best for culinary and floral projects or celebrations! Lavandin varieties are a favourite for Lavender wands, dried bouquets & wreath work. There is always room to tuck a few new Lavender plants here & there for such a variety of uses! *Important: All dried Lavender smells stronger when handled. Squeeze your sachets now & again to break the tiny cell walls on the flower buds and release more naturally stored fragrant oils. Cooking with Lavender, Teas with Lavender or projects like Lavender Bath salts; release the scent/flavour through the action of heat or hot water. 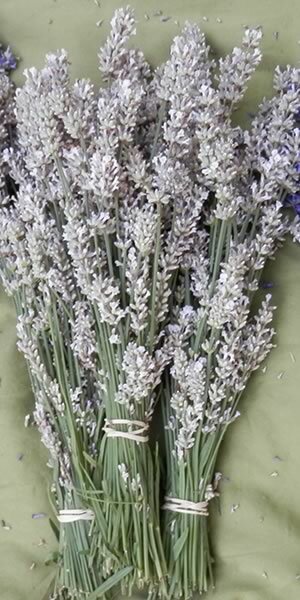 When working with bundles where you are keeping the flower heads intact ~ it is easy to enhance the scent with a few drops of pure Lavender essential oil discreetly added on the bundles!